Nicolas Lodeiro, the newest designated player for the Seattle Sounders, has been named the MLS player of the month for August. Nicolas Lodeiro of the Seattle Sounders has been voted the MLS player of the month, the league announced Thursday. Lodeiro scored twice and assisted on six goals in his five games with the Sounders since signing July 27. 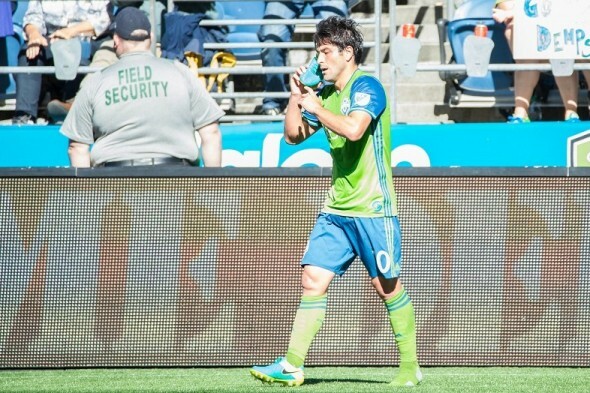 Lodeiro’s rapid integration into the midfield has helped spark a turnaround. Seattle is 3-1-2 since his arrival, to help keep playoff hopes alive. Candidates for player of the month are selected by the MLSsoccer.com editorial staff, with the award determined by a fan vote. Lodeiro received 45.8 percent, more than double Bradley Wright-Phillips (21.11 percent) from the New York Red Bulls. Other finalists were D.C. United’s Patrick Mullins (17.14 percent), Toronto FC’s Sebastian Giovinco (11.58 percent) and Jozy Altidore (4.37 percent), also of Toronto. Lodeiro is serving international duty with Uruguay, which hosts Argentina Thursday in CONMEBOL World Cup qualifying play.